Herman and Henry are back! 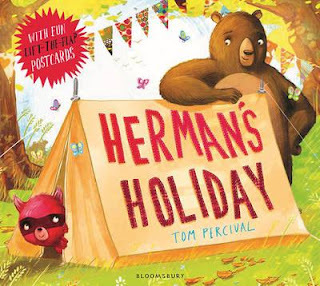 We first met this loveable duo in Herman's Letter (see review here), and now it's time for their next adventure. They're going on holiday together! A quick look at some travel brochures reveals that while there are many exciting places they could visit, the best ones all seem to be very expensive. Herman and Henry just can't afford them. Then Herman comes up with a great idea — they'll go camping! So, Herman packs everything they could possibly need — tent, sleeping bag, pots, pans. Henry packs too — TV, radio, hairdryer … mmm, perhaps Henry hasn't got quite the same idea about what camping involves as Herman. Herman is in his element! He loves the adventure of crossing a rickety bridge to get to their campsite. He has his tent set up in minutes and is soon toasting marshmallows. Henry finds it all a bit more of a struggle. Especially when his tent collapses. Their postcards home tell two very different stories. The harder Henry tries to enjoy his holiday, the worse it gets. Tom Percival's illustrations are hilarious as we watch Henry trailing in Herman's wake from one misadventure to the next. But Herman is a good friend, and when he realises Henry isn't having a great time, he comes up with a plan. Will he be able to save their holiday? Is it possible for Henry to finally enjoy camping? Kids will love lifting the flaps to read Herman and Henry's postcards to family and friends. It adds a delightfully interactive element to a story that already ticks all the picture book boxes of clever concept, engaging text and gorgeous illustrations. I hope Herman and Henry return for more adventures together.